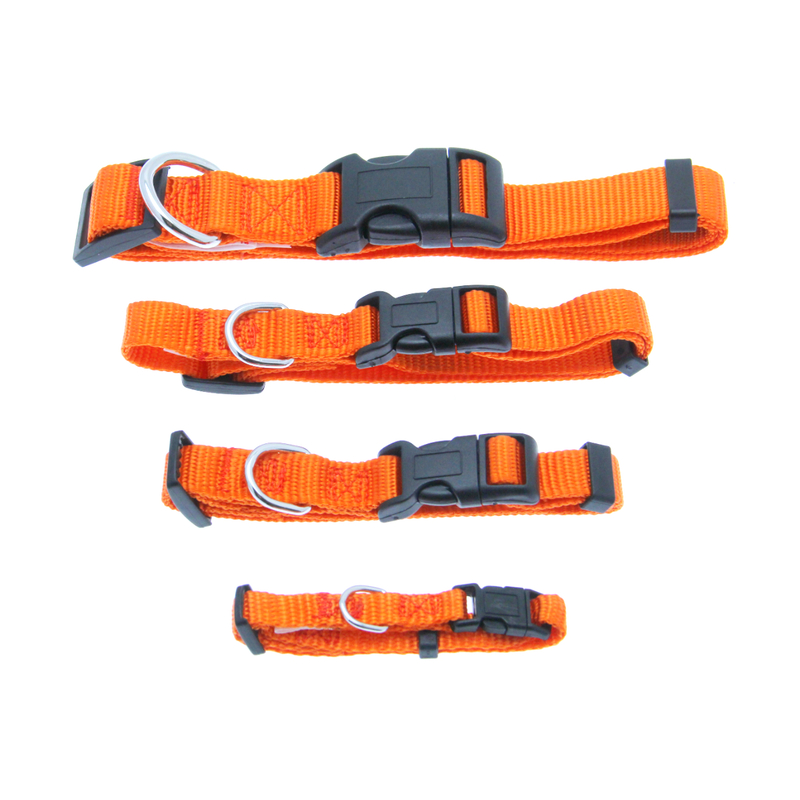 This Barking Basics!® Dog Collar in Orange is a classic design that will accentuate your dog's style. The Barking Basics!® Dog Collar will be a great staple in any dog's wardrobe. 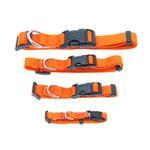 Each dog collar features a plastic quick-release buckle and a nickel-plated D-ring for leash attachment. This orange-colored collar is great because it's easy to spot. It's also a popular choice for fall and Halloween. Our orange collar and other Barking Basics products will also move your pup to the head of the team by sporting team colors! Football fans that will love our orange Barking Basics collars, leashes, tanks, and hoodies include the Chicago Bears, the Cincinnati Bengals, the Cleveland Browns, the Miami Dolphins and, of course, our very own Denver Broncos. Baseball fans that will embrace our orange Barking Basics line include the Baltimore Orioles, the Detroit Tigers, the Houston Astros, the New York Mets, and the San Francisco Giants. Are you a New York Knicks fan? Check out the entire orange Barking Basics line for the ultimate in team spirit support from your dog's corner! As for hockey fans, our orange Barking Basics products will appeal to the Anaheim Ducks, the New York Islanders and the Philadelphia Flyers. Don't forget the college and kids' sports teams too! Collect every Barking Basics collar color to suit any outfit or mood! Barking Basics Dog Collar - Orange Customer Photos - Send us your photo! It's not just for Halloween! Getting cheaper collars in many colors means my girl and I can color coordinate. I was wearing Bateman logo halter (orange insignia) -- but-- she is the real super hero! Ride em, cowgirl! My baby just looks adorable he is rocking the orange collar size small perfect fit love it. He is a yorkie/bichon 7 months and is my one true love. Brought this having in mind Halloween yes I know early but can't beat that price and quality. Posted On 10/30/18 by cynthia h from Terre Haute, IN Yes, cynthia h recommends this product! I bought three of these bright orange dog collars. They are very soft and very well made. Posted On 08/12/18 by tee from , NJ Yes, tee recommends this product! I absolutely love the Barking Basics Collection! I recently purchased this orange dog collar and I love it. It is very simple and fits my beagle very well. Posted On 09/04/17 by Sandra D from Indianapolis , IN Yes, Sandra D recommends this product! First time I have bought collar from them. Adjusts and washes fine. Holds all his tags. I use no choke harness for walks. Great fit and easy on eyes! Posted On 08/25/17 by Zima G from Colorado Springs, CO Yes, Zima G recommends this product! We enjoy this collars because it shows off nicely! Great fit and easy on eyes! Love these collars from Barking Basics! Posted On 06/14/17 by Zima G from Colorado Springs, CO Yes, Zima G recommends this product! Not only these collars are bright ( safety to both walker and pet), but they last longer than most other collars that the pet stores sell! Great buy !! Barking Basics Dog Collar is worth the price! Posted On 06/13/17 by Zima G from Colorado Springs, CO Yes, Zima G recommends this product! This collar fits great and is easy to clean. But mostly I got this for safety while walking my dog. Easy to spot and keeps its color. Very happy with my choice! Posted On 05/11/17 by Marcia M from Fairview, TX Yes, Marcia M recommends this product! This was exactly what I expected. It matched (color) the leash I ordered perfectly. It matched the on-line description. Price was ideal. Posted On 05/08/17 by Samantha D from Cleburne, TX Yes, Samantha D recommends this product! Posted On 04/10/17 by diane c from tucson, AZ Yes, diane c recommends this product! This is the perfect little collar to fit a new little, little Malti-poo. 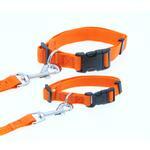 It matches the American River Choke-Free harnesses that have the orange in it. Perfect transaction. Posted On 04/03/17 by Morgan S from Bristow, VA Yes, Morgan S recommends this product! I ordered the smallest size for my puppy and it's such a cute orange color and it's super easy to use! Posted On 03/08/17 by Jennifer S from Morristown, TN Yes, Jennifer S recommends this product! Great product. We've bought them in several colors. Very well made and durable. We love these little collars and all the color choices. Orange is great for fall and helps zing autumn holiday fashions. Posted On 08/30/16 by Elizabeth C from Marysville, WA Yes, Elizabeth C recommends this product! YES- John is on a diet! Posted On 04/14/16 by Diane D from Goldsboro, NC Yes, Diane D recommends this product! Love the orange collar. I wanted it for around Halloween time. 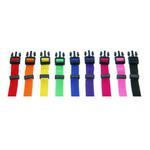 Very affordable to change collars with the holidays or season. Posted On 02/21/16 by Maxine G from Boynton Beach, FL Yes, Maxine G recommends this product! My twins always wear these collars and I love this new color. Posted On 02/05/16 by Eleanor C from Thornton, PA Yes, Eleanor C recommends this product! Perfect for my little 10# black dog...color really stands out. Posted On 01/29/16 by Laurie W from Mapleton, UT Yes, Laurie W recommends this product! Awesome collar. Well made and it is so nice to find a colorful collar in such a small size. Posted On 12/02/15 by Thomas B from Myrtle Beach, SC Yes, Thomas B recommends this product! Great product at a great price buy in every color like I did you wont regret it. Posted On 10/08/15 by Jennifer V from Dakota City, IA Yes, Jennifer V recommends this product! I ordered this and it was a little smaller than I thought. That is ok though. It is made very well. Posted On 09/27/15 by Khloe and Beth C from Sunny isles, FL Yes, Khloe and Beth C recommends this product! Well worth the price. Can't beat the price and they had a special for free shipping. Collar is durable. Exactly how it was listed on website. I would recommend you buying one.